All you need to know about abdominal fat... including how to get rid of it. Tips and advice by MD Thordis Berger. Most fat in our body is considered subcutaneous fat. This fat sits right below the skin surface and it is the kind you can grasp with your hand. Fat in and around our bellies is made up of both subcutaneous fat and visceral fat. Visceral fat, on the contrary to subcutaneous fat, lies out of reach, deep within the abdominal cavity, near our abdominal organs. Where fat ends up is influenced by several factors, including heredity and hormones. Fat accumulated in the lower body (the pear shape) is subcutaneous, while fat in the abdominal area (the apple shape) is largely visceral. How to lose excess weight? Central obesity is very common in elderly people because body fat is often redistributed to the abdominal region during the ageing process. On average, premenopausal women have half the abdominal fat of men; this is largely due to body shape. 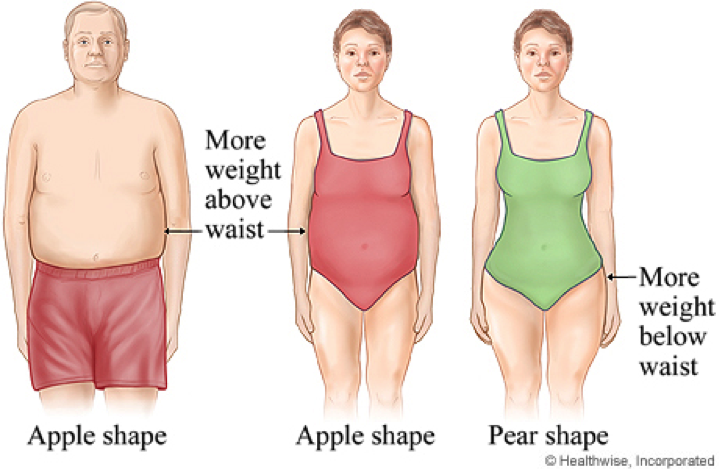 While women generally have a higher total and percentage body fat, it is more often located on their hips and thighs due to their pear-shaped bodies. Men naturally have an apple shape and carry excess weight in their abdominal region. Fat cells do more than simply store extra calories — they have proved to be much more involved in human physiology than we had previously thought. We now know that fat tissue itself acts like its own organ by pumping out hormones and inflammatory substances. Research suggests that fat cells — particularly abdominal fat cells — are biologically active . Visceral fat produces certain biochemicals, called cytokines that can increase the risk of cardiovascular disease, have deleterious effects on cells' sensitivity to insulin, blood pressure, and blood clotting. For this reason, abdominal, or visceral, fat in excess is linked to a variety of health problems . It is important to note that two people with very similar BMIs may vary substantially in the proportion of abdominal fat. Accordingly, a person with a BMI in the “normal” weight range may exceed the safe range of abdominal fat. So, even if you are considered 'normal weight,' more than average visceral fat will put you at risk for health problems. Visceral fat has been linked to metabolic diseases, increased risk for cardiovascular disease and type 2 diabetes mellitus (DM). In women, it may also be positively associated with breast cancer . The only way to definitively diagnose visceral fat is with a CT or MRI scan. However, these are expensive and time-consuming procedures. Another method you can use to measure your own fat is to take a circumference measurement of the waist and hip which will give you your waist to hip measurements. This is an easy but not entirely accurate way to measure your visceral fat. Simply measure the circumference of each with a tape measure (around the largest point) and then divide the waist measurement by the hip measurement. 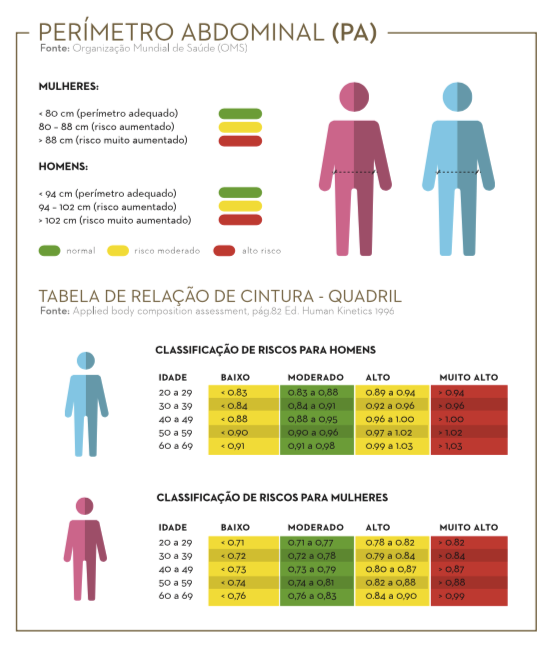 If the number is worse than 0.9 for men, or 0.85 for women then they are considered excessive. Learn more about your ideal weight and how to calculate it. The good news is that visceral fat yields fairly easily to exercise and diet, with benefits ranging from lower blood pressure to more favourable cholesterol levels. Consider regular moderate-intensity physical activity — at least 30 minutes per day (and perhaps up to 60 minutes per day) to control weight. Strength training (exercising with weights) may also help fight abdominal fat. Spot exercising, such as doing sit-ups, can tighten abdominal muscles, but it won't get at visceral fat. Pay attention to portion size, and emphasize complex carbohydrates (fruits, vegetables, and whole grains) and lean protein over simple carbohydrates such as white bread, refined-grain pasta, and sugary drinks. Replacing saturated fats and trans fats with polyunsaturated fats can also help. If you are interested in controlling your weight meet our experts that can help guide your journey towards wellbeing. Coelho M et al. Biochemistry of adipose tissue: an endocrine organ.Arch Med Sci. 2013 Apr 20; 9(2): 191–200. Elffers TW et al. Body fat distribution, in particular visceral fat, is associated with cardiometabolic risk factors in obese women. PLoS One. 2017; 12(9): e0185403. Posted in Medical and tagged Medical, Abs, Fat, Weight.